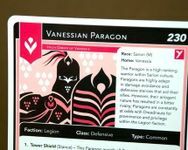 The Paragon is a high-ranking warrior within Sarion culture. Paragons are highly adept in damage avoidance and defensive stances that aid their allies. However, their arrogant nature has resulted in a bitter rivalry; Paragons are constantly at odds with Dreadnauts for prominence and privilege within the Legion faction. Despite their ongoing feud with Dreadnauts, they actually pair up quite nicely. The Dreadnaut's offensive capabilities are the perfect complement to the Paragon's damage absorption.